Last year, I took part in a local art gallery's celebration of El Dia de los Muertos-- the Mexican celebration of the Day of the Dead-- and made an altar remembering Edgar Allan Poe. That was my first venture into creating a piece to remember someone on the Day of the Dead; and Edgar was a natural subject, being that his writing so heavily influenced my life from a very early age. I loved the experience of creating Edgar's altar, and everything it stood for-- esentially making an installation piece of art to memoralize and celebrate the departed during the fall harvest season, when death stands over all our traditions, holiday and celebrations. I was fortunate enough to have a great response to my piece; and so grateful for others who appreciated, understood my remembrance of Edgar. I jumped at the chance to make another altar this year. At first, I had no idea who I would memorialize. I had several ideas in mind, with some seeds of a possibility. But nothing took hold and developed in my mind as fast as the idea for Poe did last year. And then Ray Bradbury passed away. I wrote a bit about the influence Ray had on my life here on this blog; like Poe, Ray's novels and stories so centered on the dark, the fall and All Hallow's Eve gave me a great friend and companion, as a child of Halloween. After writing the post about Ray, I had the idea to make an altar for him on the Day of the Dead. The first ideas I had for Ray weren't the best, or most complete. My first thought was that in addition to Halloween, Bradbury's legacy is, most popularly, his novel "Fahrenheit 451": a tale of a human future where the government censors all books, and burns them. In most every part of our world today, we may not burn books-- yet. But there are governments, people and other forces out there who have no problem banning them, or trying to. It made sense to me that part of Ray's altar had to be the attention he drew to burned/banned books, and the supression of thought and the written word. Initially, I thought I would pile stacks of books that had been banned or are commonly challenged. Think "Harry Potter," and "The Adventures of Huckleberry Finn" and "Of Mice and Men." There are so many commonly challenged books, I could go to a thrift shop and pick up whatever I didn't have. And then I found this old Corona typewriter at an estate sale. Something about it-- being older, an antique, so writerly, appealed to me; without ever thinking of Ray and his altar. The idea occured later, when I was watching an interview with him and looking for ideas to help remember him and he talked of writing on his typewriter, that I could use the typewriter as his, for my altar. I could even have a piece of his writing coming out of it. I would pile the banned books around the typewriter-- and I thought I had my altar. One big sticking point for me was the fact, though, I didn't have enough planned to remember Ray's love for Halloween, October, and all the things of the harvest. For a long time my concept felt incomplete. Until, in late October, a harsh wind storm brought down a tree that had been dying in my backyard. I hated that the tree had come down-- and angrily I broke it into pieces to be more easily taken away. I looked at the pieces of tree in my hand, and knew then that I had to use these as part of my altar-- because of Ray's "The Halloween Tree." I had been looking for a way to connect this novel, especially, to my altar, as there is a whole part in the book about the Day of the Dead. And here the way was. The final altar, titled "Ray Bradbury: 1920 - 2012," is an old red writing/end table. On top of the table is the typewriter. 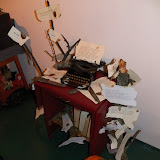 In the typewriter is a piece of paper with a qutoation from Bradbury's "Fahrenheit 451," and around the typewriter are other Bradbury writings, from that novel and "The Halloween Tree." The pages are burnt. Also on the table are pieces of wood from the branches of a tree. Leaning against the table are two big branches from that tree-- and instead of the jack o'lanterns from "The Halloween Tree," the branches hold pieces of burnt paper, with selected passages from commonly challenged and banned books. All of Ray's work is on the typewriter and the table; his legacy, the books that go on to be banned, are on the branches surrounding. In the bottom of the desk are unknown books, faced backward; and another branch with banned words. At the foot of the piece is my traditional El Dia de los Muertos food element: a carved pumpkin, with the numbers "451," made to look like flames. No real books were harmed in the making of this altar. I was nervous that it wouldn't be easy to know by sight what the altar was about, who it may directly be to and the difference betwen the paper "book pages" and why they were burnt. I was endlessly thrilled at the opening of the "Altars" show when numerous people got it, exactly. It felt wonderful that I could honor Ray Bradbury and his legacy, in my small way, and have others remember, as well. The absolute best compliment I received all night was from one of the other altar artists, who told me, "Thank you for remembering him."